We LOVE crafting with Nature… actually we LOVE crafting recycled materials, TP Roll Crafts AND easy nature crafts for kids! And what do they all have in common? They are FREE! 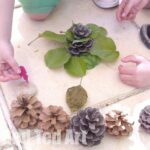 AND you need to use your imagination and really CHALLENGE your imagination to come up with cute and easy nature crafts for kids. I also love that nature crafts, get kids close to nature by definition… after all… you have to spend time in the great outdoors FINDING stuff to craft with. It is a wonderful way to explore your local environment as well as experience the seasons… with conkers and acorns in Autumn, wonderful pebbles and shells from the beach in Summer and “growing crafts” in Spring. Sticks and pine cones are frequent craft materials for us in Winter! 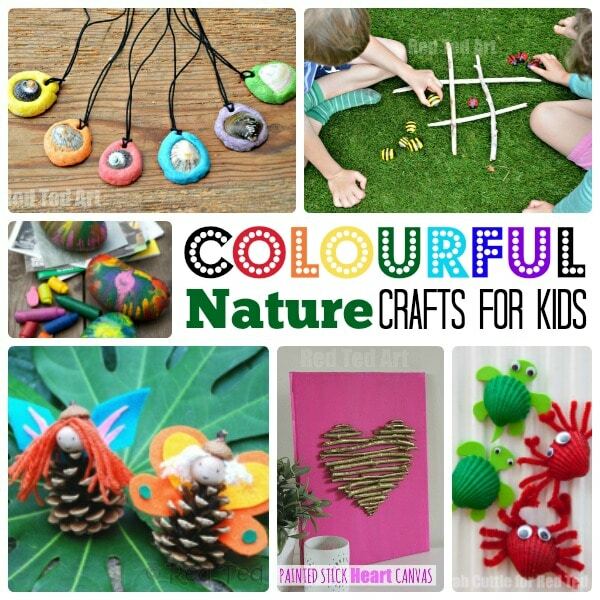 We also have a great set of Nature PLAY ideas – where unlike for the easy nature crafts – you literally ONLY need nature! There are lots of ways to group this round up, but I decided it would probably best to stick by craft material – rather than seasons (as we all have different seasons) or type (e.g. 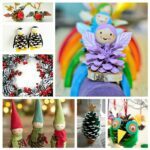 DIY Ornaments, as some nature crafts fall into different categories). Having said that, I do have a great selection of Easy Autumn Crafts for Kids and Easy Autumn Crafts for Preschoolers, you may enjoy! We adore pine cones. 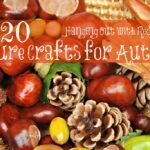 For me they are all about Autumn crafts, however, you can usually find them all year around. I am not sure why I associate them with Autumn. I love how wonderfully tactile they are.. and they are surprisingly awkward to craft with!! So hopefully you will find some great nature crafts made here today using pine cones (and occasionally other materials too). One of our simplest ideas for pine cones is to make an Autumn Mobile. Easy and fun and a great way for combining different nature finds all in one craft. Pine cones are also great for turning into easy Pine cone Bird Feeders. I think that they look wonderful too and it is a suitable nature craft for preschool. We also had great fun with this cutest little Pine Cone Hedgehogs! Finally, how about these absolutely LOVELY and oh so simple Pine Cone Snowy Owls and have made them at home, in school and with our local scout group! Brilliant. Make super simple pinecone fire starters – these make a great Christmas Gift for a cozy winter’s night! We also have wonderful Pine cone Owls (that we use as Christmas Ornaments but they are a lovely decoration all year round). 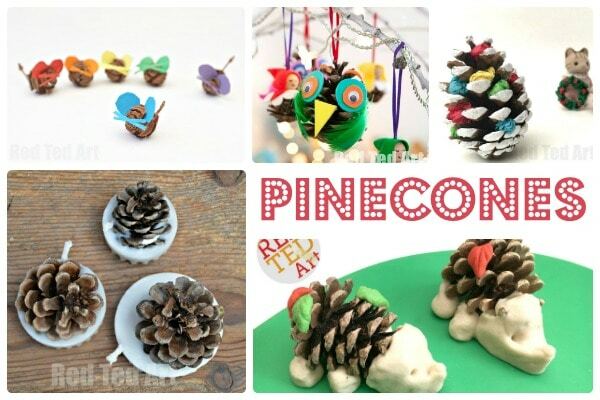 Have fun with these simple Nature Pine Cone Critters which we made on our summer holidays one year. I would love to share our Pine Cone fairies – though Pip Squeak calls them angels! I love the colourful felt fairy wings. Next, we have these Pine Cone Elves / Babies Christmas Ornaments – these are simply darling. And finally, we also adore this set of Pine cone Rainbow Fairies! 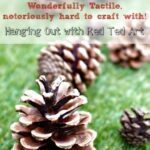 And if you are looking for more pine cone craft inspiration, from both Red Ted Art and lovely external sites, we have more Easy Pine Cone Crafts for you browse! From pine cones to shells – this brings us right into the heart of Summer! Of course, you can find shells all year round, but we tend to mainly go to the beach in the Summer holidays. 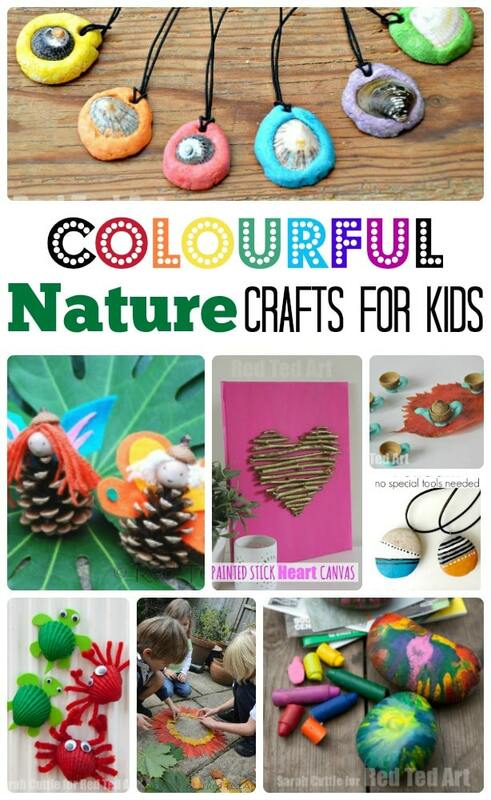 So fur us, Shell Crafts for Kids are very much a Nature Craft for Summer!! What to make with shells. First up we have these super simple Drift Wood and Shell Rattles – bring a long a piece of string or elastic and you can make these ON the beach. Wonderful. Decorate at home with some wool. As with the nature mobile above, we love combining beads, stones and shells into a pretty Sea Shell Mobile. We actually have TWO of these in the garden now and they have lasted really well. 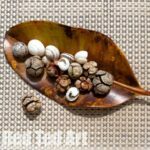 This is a fantasic and easy DIY that even young kids can make – Easy Shell Necklaces – no drills or holey shells required and super colourful too. Finally, we have long been in love with our Crab Shell Fridge Magnets! 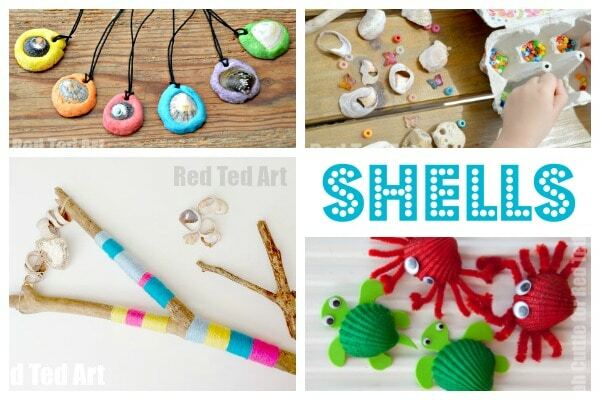 Find (many) more Shell Crafts from Red Ted Art and 3rd parties!! Love love love this collection of Shell DIYs! 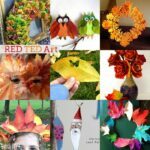 Leaf crafts for us are mainly about Autumn Crafts for Kids – however some of the crafts below can be made all year round. I find trees lose leaves not just in Autumn. You may also enjoy or find this 6 Ways to Preserve Leaves post handy before you proceed with this section! 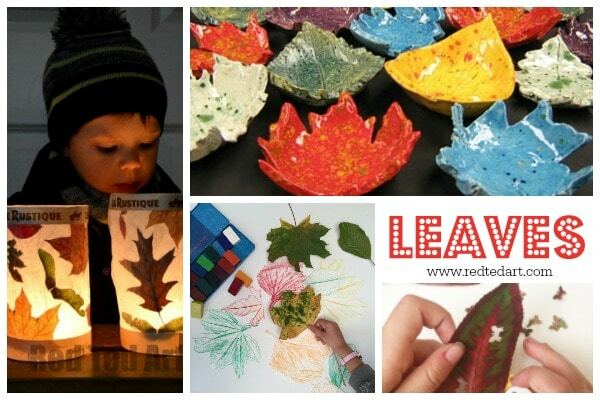 This is our favourite leaf craft **ever** – as these Leaf Lanterns are so very very easy to make and look absolutely fabulous! As an alternative, we have super simple (one)Leaf Luminaries that would look great as a quick table decoration! Oh I fibbed, we have TWO favourite leaf crafts. The leaf lanterns above, and also tehse fantastic Leaf bowls! We also enjoy making these Leaf crowns. A seriously undervalued and super fun for when out and about – perfect for any Forest School activities. You can’t have a leaf craft collection, with out some classic Leaf rubbings – a bit of arty fun, but can we used for other crafts too! You can also explore the Great Artists with this great Autumn Andy Goldsworthy project. A simply stunning way to explore colours and shapes. Leaf Faces – a great way to get arty with leaves, or alternatively you can turn your leaves into Woodland People! I am not sure if “leaves” is the right section for these.. they kind of use a bit of everything, but leaves are super important when making.. FAIRY HOUSES – we love the natural magic of these and how each fairy house is different depending on your local environment and seasons.. we have a Fairy Teepee, a Fairy Summer House and a Fairy Winter House! Finally – shown in image above, but has no extra blog post – create “nature confetti” using leaves and shapped hole punches. Use it for collages or table decorations or to throw at weddings! Well, my kids adore STICKS. They can’t help collecting more and more and more of them and we always seem to have a huge collection of them at home! So it is time we made something from them…..
One of the simplest and most favourite stick craft for kids of all time, are our SUPER QUICK Stickman How To. Really it doesn’t get much faster than that. 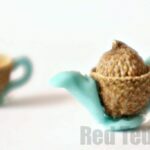 It is also one the crafts featured in Red Ted Art the book! One year, sticks also featured heavily in our Four Seasons Art project – we created Stick Tree collages for each season. So sweet and pretty! We also love using sticks in our general crafting – a stick from our walk, became the Hobby Horse’s stick. They are great as part of a Shell Mobile (that we mentioned above, as well as our Autumn Nature Finds mobile)! Easy and fun. We love making own Tic Tac Toe Game. Turn your sticks into nature rattles (mentioned above under shells too). These are also a great “beach keepsake” and can be made ON the beach if you wish. And we love this “twiggy” heart art work – so so so pretty and definitely worth checking out! Make gorgeous Dog Wood Heart Ornaments! Check out our “Nature Play Ideas” for the Stick Arrow featured in the image above! Love sticks? 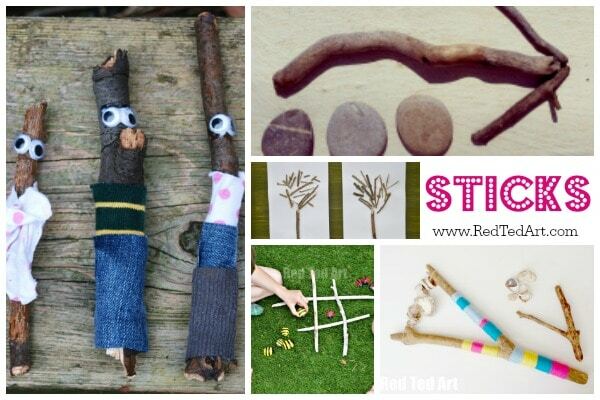 Need yet MORE Stick Craft DIYs? Look no further! Another nature find that is quite plentiful is the humble stone. Especially if you live near stony beaches (oh how we would love a golden sandy beach near us).. nevermind.. our local (ish) beaches all yield different sorts of stones. Some flat, some with holes, others big and heavy.. and depending on what you can find, here are some great stone crafts for kids as part of your nature activities for kids. We love making these little Stone Pets. I love this stone craft, as it keeps the “nature” of the stone in tact – i.e. you are not painting it or changing it (much). Easy Stone Pendants – yes these ARE easy, I promise, you don’t need special tools to bore holds or find stones with holes in them already. Find out how we attached them to our pendants. So pretty! Glitter Heart Rocks – these make cute little gifts to decorate your desk or keep in your pocket. Quick and easy. Rock Paper Weights – another favourite of ours, as they are soooo fun to make and a great way to use up all those odds and ends of crayons lying around the art cupboard. Bee & Ladybird Tic Tac Toe – love this DIY Stone Game.. the little bees and ladybirds are so quick and easy to make. Gorgeous. Simple Garden Planters – again a stone craft that we made many moons ago, and still have a number of these knocking about the garden. So sweet! Lady Bird Stones – similar to the tic tac to game…. you could make these with different numbered spots and use them for counting. Stone Owls – love how simple these are. Your stone becomes your canvas. And mentioned before, you can make wonderful Shell & Stone Windchime! Last but by certainly not least, we have some fantastic DIY Rock Rings. They are just too cool for school. Need MORE ideas? 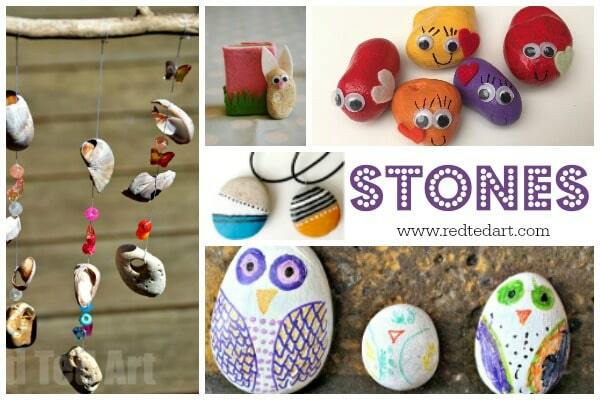 Check out the special “Stone Crafts For Kids” collection containing both the above and additional external craft activities too! 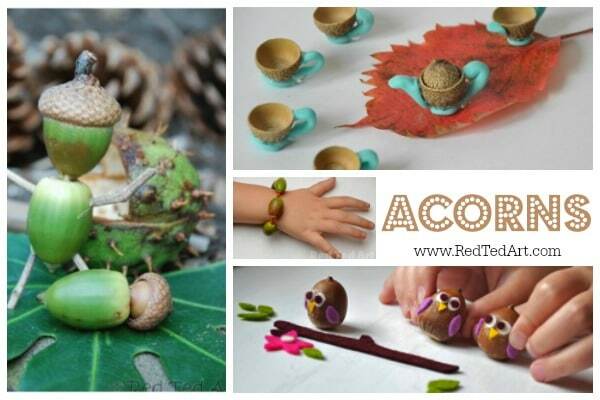 We are slowly coming to the end of our Nature Crafts for Kids collections.. and have a handful of adorable acorn crafts for you to browse. And these are the cutest little Acorn Owls Ever! Our last category for this post – CONKERS – what are conkers I hear you say.. they are horse chestnuts or chestnuts or also known as buckeyes in other parts of the world. Lovely brown shiny things! Definitely part of Autumn Crafting! Conker & Plasticine Animals – combine plasticine with conkers, makes it really easy for younger children to work with this wonderful nature material. It creates an explosion of colour and is lots of fun. od’s Eyes are a popular Summer craft, but they also look beautiful as Chestnut and Stick Weaving Craft for Autumn. These are probably one of our favourite little Conker Crafts – Cute Pencil Toppers – I love things you make that you can “use” and keep! Conkers or Buckeyes make great Puppet Feet! As they are easy (ish) to make holes into and have a great little weight to them. 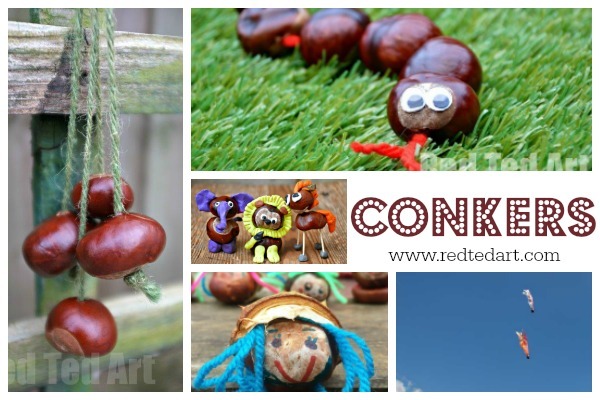 These Simple Conker Stream Toys are so easy and super fun to make! And look WONDERFUL flying through the air! Learn the British traditional game of Conkers – a childhood classic, soon to be forgotten if the new generation don’t learn How to Play “Conkers” soon! 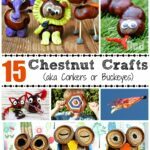 For more Chestnut Crafts – including the ones above and more – take a look at this collection of Chestnut Crafts for Kids! If you are after some more Nature Craft Inspiration, take a look at the wonderful Mother Nature Blog – Nature Crafts and Forrest School in one! hi, marry. I love your all lovely kiddy, crafty ideas, it;s very interesting for every kid.and more creative item for the kid. thanks .